But by the time we reach that telescope and the imaginative gallery it introduces, we have seen things even more remarkable: ornately decorated quadrants of enameled brass, metal calipers, arcane charts, minutely inscribed maps, spheres within spheres like compass roses from other worlds, codexes and manuscripts, cylinders, dials, rings, rods and boxes. Some of these are extraordinarily beautiful: finely wrought, elegantly constructed, sensuously formed. Like the telescope, some also have the aura of having once been handled for profound purposes: a set of brass compasses in a battered black case are said to have been used by Michelangelo. They are all instruments of exploration and investigation, models of planetary and stellar motion, surveying instruments and mapmaking equipment. Nearly all were made during two centuries of the Italian Renaissance. And as presented here they are the accomplishments of a culture created by the patronage of the Medici dynasty in Florence, rulers whose portraits are on display. The presiding genius is not Galileo but Cosimo I (1519-1574), the first to transform the commercial Medicis into rulers. 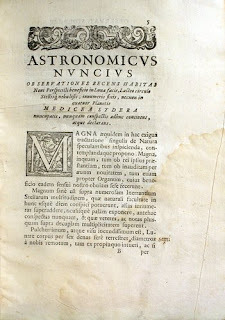 It was Cosimo, we learn, who constructed the Medici cosmos, who took the themes of the Italian Renaissance and wove them together, supplementing the systems of the great ancients — Euclid, Archimedes and Ptolemy — with other ideas: that knowledge was an aspect of power, that power was required for proper order and that social order itself can lead to an increase in knowledge. Social order, in fact, was seen as a reflection of geometric order. Geometry and surveying were necessary to master the physical world; knowledge of mechanics was necessary to create military fortifications and weaponry. There are gun sights here that look like surveying instruments, and surveying instruments that were worn like swords. While creating a new state, Cosimo celebrated the era’s developing cosmos by commissioning Giorgio Vasari to oversee the redesign of a palazzo, also creating the Map Room, a tribute to human knowledge, reproducing on its walls the maps of Ptolemy’s second-century “Cosmography.” A computer animation here shows the elements of his plan, some left unfinished. From openings in the ceiling’s map of the heavens, two immense globes — celestial and terrestrial — were to have been lo wered into the room. Here too is a reproduction of a ceiling mural from the Room of Military Architecture — also known as the Mathematics Room — that portrays a mythic history of mathematical enterprise in which some of the very instruments displayed in the gallery are shown. And while today we call the 4 largest moons of Jupiter, Galilean satellites, Galileo himself called them Medicean Stars in Sidereus Nuncius in honor of his patron family (Grand Duke as Jupiter and his 4 sons as the satellites of Jupiter). One minor correction: In the interview Derrick Pitts says that the discovery of the Galilean satellites provided Galileo a visual evidence in support of the Copernican model of a heliocentric universe. This is not correct. The discovery of the satellites showed that not every thing is revolving around the Earth - as was claimed by the Ptolemaic system. So it was more a blow against absolute geocentrism rather than a positive evidence for heliocentrism.